I travel a lot with the kiddos, and it is easier to do it without the carseats. Here are a few suggestions on how to accomplish that...safely. 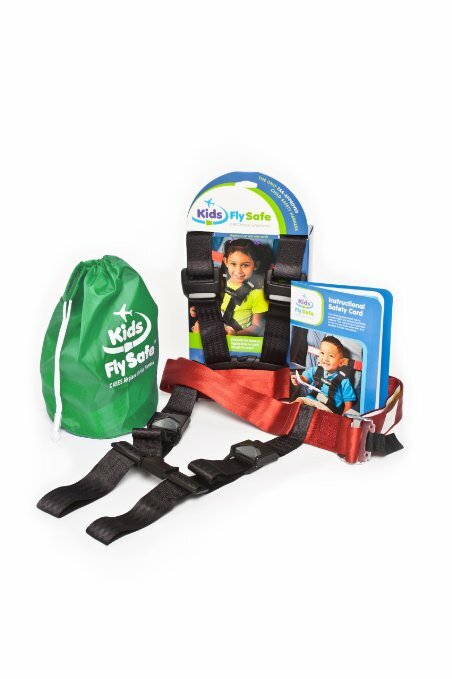 The CARES harness is an FAA approved device that turns that airplane seat and seatbelt into a five point harness. It should not take the place of having an installed carseat on the plane, but I know stuff happens. Sounds cool, right? It is! The first pro is that the harness is super small. It comes in its own pouch and weighs less than a pound. When I traveled solo with the kids to Florida, I wasn't able to carry two car seats by myself. The Honeybadger was too little to safely sit in the lap belt on the plane so it was a great solution! The downside. It is a bit of a pain to assemble on the plane and it requires the kindness of the person sitting behind your child. Why? In order to make it a five point harness, the belt must be secured around the back of the seat and under the tray behind it. While it is certainly easier than installing a car seat, it isn't super easy. You do have to adjust and bother those around you while installing it. There is another product that I love for airplane travel with littles and its the Infant Flight Vest Travel Harness. I am very scared of turbulence and if my baby is out of the seat for any reason (including nursing) they are strapped into this vest. The vest is threaded through the lap belt that you use and Oh Boy! Its a cinch. I can't recommend this enough. Its super small, very light, easy to install, and baby will not go flying if they are out of the seat. The vest does not take the place of a car seat and I recommend that you do have a carseat for infant travel. Do you have any must have safety essentials?